In its continued efforts to diversify the sources of energy used to power the city of Fremont, General Manager of the Department of Utilities Brian Newton and Lon D. Wright Power [Plant] Superintendent Jeff Shanahan have turned to the wind … so to speak. The Fremont Board of Public Works plans to begin pushing “requests for proposals” for the acquisition of wind energy that could supply the city between 30 to 40 megawatts of energy . 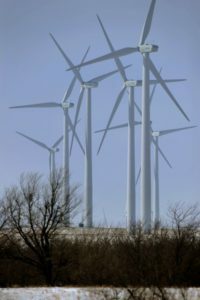 . . “It would be leading edge in Nebraska,” Newton said of retaining that amount of wind energy. “(Such a) change would put us in the category of Omaha, Lincoln and Grand Island.” Click to read more. This entry was posted in Nebraska / Midwest News, NewsBlog and tagged Fremont Tribune, Greentech Media, John Liesveld, La Crosse Tribune, Las Vegas Sun, Lincoln Journal Star, renewable energy development in Nebraska, Solar Power World, Utility Dive on July 13, 2016 by Helen Deffenbacher.